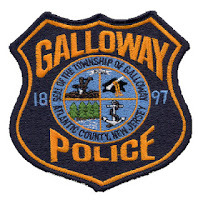 Galloway Township Police responded to an accident at Cologne Avenue and White Horse Pike at 11:40pm Friday night. The accident occurred after Michelle Kolb was traveling west bound on The White Horse Pike in her 2003 Pontiac Grand Prix approaching the intersection with Cologne Avenue when Katie Seaver (driving a 1994 Chrysler New Yorker) made a left turn onto Cologne Avenue from The White Horse Pike causing both vehicles to collide. Due to the accident, west bound traffic on The White Horse Pike was detoured for approximately one half hour. All three individuals involved in the accident complained of minor pain and were treated on scene by Galloway Township EMS. As a result of the accident investigation Katie Seaver was issued a summons for Failure to Yield to Oncoming Traffic. Michelle Kolb was placed under arrest and charged with Driving While Intoxicated. During the accident investigation passenger, Daron Kolb, was placed under arrest by police for several charges including obstruction of justice, resisting arrest, disorderly conduct, and harassment. He was released on a summons pending a future court date. Summonses were issued to Katie Seaver for Failure to Yield to Oncoming Traffic. Michelle Kolb was issued a summons for Driving While Intoxicated. Daron Kolb was charged with disorderly conduct, obstruction of justice, resisting arrest, and harassment.